L3 is located under L2. L4 and S44 are located under S28/U152. L5, L6 and S69 are located under U106. L7, L8, L61, S121, S122, S123 and S124 are located under P312/S116. L9 and L10 are located under L21. L12 is located under M198. L50/S136 is located under L23. M228.2 is located under L20. PK5 is located under M17. S50 is located under M269. Identical SNPs that were discovered separately are listed in alphabetical order, not necessarily in the order of discovery, and separated by "/". Examples: M207/UTY2, M306/S1, M173/P241, SRY1532.2/SRY10831.2, L23/S141, L48/S162, L11/S127, P310/S129, P311/S128, M405/S21/U106, M467/S29/U198, DYS439/L1/S26, P312/S116, M167/SRY2627, S28/U152, L2/S139, L20/S144, L21/S145, M222/USP9Y+3636. SNP SRY1532/SRY10831 appears twice on the Y-DNA Haplogroup tree. It is first seen as a mutation SRY1532.1/SRY10831.1 which is reported as a positive in BT and then reappears as a back mutation SRY1532.2/SRY10831.2 which is reported as a negative in R1a. Thanks to Jim Wilson, Thomas Krahn, and David F. Reynolds for their consultation on Haplogroup R.
Y-DNA haplogroup R is believed to have arisen approximately 27,000 years ago in Asia. The two currently defined sublcades are R1 and R2. Haplogroup R1 is estimated to have arisen during the height of the Last Glacial Maximum (LGM), about 18,500 years ago, most likely in southwestern Asia. The two most common descendant clades of haplogroup R1 are R1a and R1b. R1a is believed to have arisen on the Eurasian Steppe, and today is most frequently observed in eastern Europe and in western and central Asia. R1b is believed to have arisen in southwest Asia and today is most frequently observed in Europe and especially in western Europe, which it entered after the LGM largely in the form of R1b1b2. The Atlantic Modal Haplotype, or AMH, is the most common STR haplotype in haplogroup R1b1b2a. R2 is most often observed in Asia, especially on the Indian sub-continent and in central Asia. Behar et al, Contrasting Patterns of Y Chromosome Variation in Ashkenazi Jewish and Host Non-Jewish European Populations. (pdf) Human Genetics 114:354-365, 2004. Karlsson et al, Y-chromosome Diversity in Sweden - A Long-time Perspective. (pdf) European Journal of Human Genetics, 14:963-970, 2006. Karafet et al (2008) added on 4 May 2008. Repaired spelling on Myres et al 2007 on 4 May 2008. Changed M18 from private to regular SNP on 4 May 2008. Added David Weston et al and Dennis Wright to Additional Resources on 4 May 2008. Added David Wilson and Vincent Vizachero as contacts for Haplogroup R on 4 May 2008. Added Charles Moore to Additional Resources on 6 May 2008. Notes added on uncertainty of location relative to P297 added to R1b1a and R1b1c on 7 May 2008. Haplogroup R description rewritten on 7 May 2008. The location of M37, M65 and P66 beneath S116 has been confirmed and the disclaimer removed on 9 May 2008. The location of S128 and S129 have been on confirmed on 9 May 2008 and are no longer marked provisional. SNPs L2/S139 were added on 26 September 2008. Notes for M126 and M160 added on 1 October 2008. Added L11, L20, L21, L23, L44, L45, L46, L47, L48, L49, L51, L52, P310, P311, P312, S144, S145 on 7 November 2008. Removed John McEwan and David Wilsons as contact people for Haplogroup R on 7 November 2008. SNPs L48, L61, L62, L63, S141, S162 were added on 15 Decenber 2008. Corrected subclades for L49 and L48/S162 on 21 December 2008. Changed location in Notes for L9 and L10 on 22 December 2008. Contact person for Haplogroup R: Vincent Vizachero. 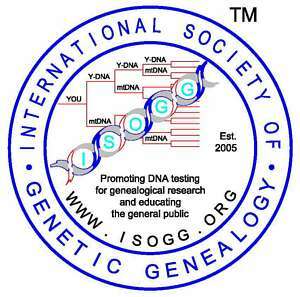 Copyright 2007, 2008. International Society of Genetic Genealogy. All Rights Reserved.